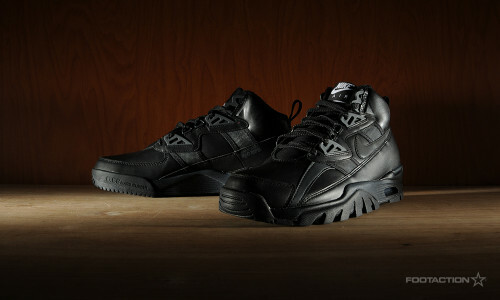 The Nike Air Trainer SC receives the Sneakerboot treatment, which feels like a natural adaptation for the sneaker. Already a high-top shoe, this rethought version is perfect for the harsher climates in the upcoming colder months. Draped in a black-on-black colorway dubbed “Blackout”, the sneaker is also outfitted with workboot-style lace rings and a chunkier outsole. Available in stores and online. Check out Release Locator for stores. Print article This entry was posted by hhcblog on November 10, 2014 at 10:40 am, and is filed under Footwear. Follow any responses to this post through RSS 2.0. You can leave a response or trackback from your own site. A 1989 Classic A Nike Basketball Retro returns. The Nike Air Flight ’89 is back in all-white, faux ostrich leather side panels and bold 89 detailing on the heels. See more detailed images below and pick these up in stores Friday, October 2nd for $ 110. Check out Launch Locator for stores.